The number of patients with chronic kidney disease (CKD) is increasing worldwide. The risk factors for CKD include people aged >60 years, with uncontrolled high blood pressure, uncontrolled diabetes, and cardiovascular disease. Patients with different levels of CKD are expected to require dental treatment in their life at any stage of kidney therapy. Early kidney dysfunction might be asymptomatic and some patients could seek dental treatment with oral diseases related to undiagnosed early CKD. Therefore, it is essential for dental care providers to have basic knowledge about kidney functions. This will help to refer undiagnosed/suspicious early renal disease, understand the pathophysiology of the most common oral lesions in renal patients and facilitate and provide safe dental treatment. The aim of this review paper is to help dental and nephrology teams to have some knowledge of renal patients' needs for dental treatment. The estimated glomerular filtration rate (eGFR) is the most commonly used index to evaluate kidney function by many nephrologists. The normal range of eGFR is 90–120 mL/min. CKD is considered when the eGFR is less than 60 mL/min/1.73 m2 for three months or more. The Kidney Disease Outcomes Quality Initiative (KDOQI) classified the severity of CKD based on the eGFR [Table 1]. A systematic review and meta-analysis found that the global prevalence of CKD for stage 1 is 3.5%, for stage 2, it is 3.9%, for stage 3, 7.6%, for stage 4, 0.4%, and for stage 5, it is 0.1%. Thus, based on these prevalence rates, dental care providers are expected to treat more patients with CKD at any stage. Untreated CKD leads to progressive kidney damage, which requires further complex medical treatment. This makes the clinical decision of the required dental treatment not easy. Based on the KDOQI; the nephrology team is generally involved during stage 3 and beyond. In late stages (4 or 5), patients with renal failure need renal replacement therapy (RRT). Table 1: The classification of renal failure by the Kidney Disease Outcomes Quality Initiative. Patients with early kidney dysfunction often have pale oral mucosa because of anemia and dry mouth due to imbalance of water and electrolytes. Enamel hypoplasia might develop in children with chronic renal failure as a result of metabolic acidosis. [Table 2] presents kidney functions and the most common oral lesions that might develop in patients with impaired kidney functions, with suggested treatment. Dioguardi et al reviewed 47 articles related to the oral manifestations of chronic uremia patients (stage 4–5 of CKD) and observed that 90% of patients with renal failure suffer from oral and/or dental diseases, including gingival hyperplasia, oral bleeding, and petechae. A systematic review of 88 observational studies in 125 populations comprising 11,340 adults found that periodontitis and edentulism affected 56.8% and 20.6% of patients in stage 5 of CKD, respectively. In Iran, a cross-sectional study on 30 renal patients undergoing HD had higher mean salivary urea level and pH value compared to those of the control group. This high level of urea in the saliva leads to an increase in salivary pH to a high value and explains the high prevalence of halitosis in renal patients. It is necessary to refer patients with high urea levels to the nephrology team for early medical management; otherwise, uremic stomatitis might develop. Dental care providers, in turn, can anticipate high urea levels by the presence of halitosis (ammonia-like odor) with a low level of dental caries. Table 2: Oral manifestations of impaired kidney functions with suggested dental and medical management. Since it is crucial for dental care providers to have basic knowledge about kidney functions while managing this group of patients, the nephrology team should also understand the patient's needs during dental treatment, which is considered one of the responsibilities that should be provided in the referral letter by dental care providers prior to any dental procedures. Scully et al suggested a multidiscip-linary team (MDT) to deliver a high standard of dental and medical treatment through an integrated care pathway for patients diagnosed with CKD [Figure 1]. This will help to provide safe dental treatment and avoids any anticipated complications in renal patients, such as bleeding, infection, and drug toxicity. Figure 1: The suggestion of Scully et al to the healthcare professionals who may be involved in the multidisciplinary team (MDT) when managing renal patients. The nephrology team should ensure that renal patients are referred to an appropriate dental specialty if they require dental treatment during their nephrology appointments. Renal patients need to be treated under the care of a specialist in special care dentistry (if available), an oral surgeon, or a dentist trained to manage medically compromised patients, while pediatric patients with CKD are better managed by a specialist in a pediatric dental team. Later on, patients should be encouraged by the dental team at the secondary care center to register with their local general dental practitioner (GDP) in the primary care center/community dental services to receive regular follow-up, monitoring, and preventive care. The nephrology team should be advised to include in their referral letter to the dental team the patient's medical history, the stage of the patient's CKD, current medications (especially antiplatelet or anticoagulant agents), and recent full blood count results. This will help the dental team to have a general idea about the patient's medical health status and incorporate it with the patient's dental needs to deliver safe dental treatments and determine the level of dental care that the patients require (primary or secondary care center). The dental team, either in the primary or secondary care centers, should provide the nephrology team with clear ideas about the planned dental treatment. For example, it is crucial to determine the type of the planned dental treatment (i.e., dental extraction, restorative dentistry, supra-gingival scaling, and root surface debridement or oral biopsy), type of local anesthesia, types of local hemostatic measures (i.e., sutures, local hemostatic agents, and topical tranexa-mic acid), and the presence of any dental infection, and determine the type of medications that might be prescribed (i.e., antibiotics, analgesics, and antifungals). This will also help the nephrology team to determine if any additional systematic hemostatic measures are required (i.e., desmopressin, platelets transfusion, or systemic tranexamic acid), if pre-and/or post-antibiotic prescription is required, and they will advise on adjustment of doses of any medications that are planned to prevent possible drug toxicity. It is essential for the nephrologists to highlight the importance of the referred patients who are at a late stage of CKD (stage 4 and 5) prior starting RRT (i.e., renal dialysis or kidney transplant) to a specialty center for dental assessment. Different studies have shown that patients with end-stage kidney disease (stage 4 or 5) have poorer oral health status and they require a high amount of dental treatment.,,, Patients should have a thorough clinical and radiographic examination and treatment to ensure they are dentally fit prior to RRT to reduce the future needs for dentistry. A nationwide population-based study was conducted on 10,457 individuals; they were divided into three groups as follows: healthy control group = 1438, high-risk group = 3392, and CKD group = 5627. The study concluded that adequate prevention and management of oral disease might improve prospects for CKD patients. Early intervention should be aimed at improving oral and dental health, to reduce the impact of oral diseases, improve patient's quality of life, and prevent the effects of poor oral health on the patient's eating ability, which might affect nutritional status. Patients on dialysis are less likely to adhere to oral hygiene instructions and are less compliant with dental visits than healthy patients., Patients on HD usually receive treatment three times per week, each session requiring 3–5 h. Generally, they are heparinized, and they require liaison with the patient's nephrologist prior to dental treatment to decide how the management of oral bleeding can best be prevented locally by the dentist and systemically by the nephrologists if it is necessary. Therefore, predialysis dental assessment and treatment will help to improve oral health status, with emphasis on oral hygiene instructions, the importance of adherence to advice and compliance with dental visits. Dental care providers who are concerned about treating renal patients on dialysis should always focus on achieving proper hemostasis following dental procedures, which induce bleeding (i.e., dental extraction, scaling, and root surface debridement) and preventing dental infection. Hemostasis is impaired with renal patients on dialysis due to different reasons [Table 3]. Therefore, dental procedures are avoided on the same day of dialysis. Patients will also be tired from lengthy dialysis. Local hemostatic measures and treatment on non-dialysis day are effective ways that help to achieve proper hemostasis, but prior liaison with the patient's nephrologist is necessary. Furthermore, dental care providers should ensure the protection of the dialysis fistulas and grafts during procedures. In the event of needing conscious sedation, it is recommended not to cannulate or to use a blood pressure cuff on the arm with an arteriovenous fistula. Conscious sedation should not usually be carried out when the hemoglobin level is below 10 g/dL. Table 3: Etiology of impaired hemostasis in patients with chronic renal failure. Patients who attend an acute emergency department should be treated with caution to avoid prolonged bleeding episodes. Dental care providers are required to check blood counts before any dental procedure, which induces bleeding. No dental extraction or regional block (i.e., inferior alveolar nerve injection) should be performed with platelet counts below 50 × 10/L and 30 × 10/L, respectively. Furthermore if possible, acute dental pain should be managed on a non-dialysis day. However, in case of an invasive and urgent dental procedure required on the same day of dialysis, nephrologists can sometimes use normal saline instead of heparin. The half-life of heparin is 1–2 h and it is usually effective for up to 6–10 h; therefore, these two points might be considered if an urgent, invasive dental procedure is required on the dialysis day. In case of thrombocytopenia, various techniques might be considered by the nephrology team to raise platelet numbers. For example, platelets transfusion could be considered 1 h prior to dental treatment that could induce bleeding. However, if specific blood tests (i.e., prolonged bleeding time and low platelets aggregation tests) show impaired platelets function and/or adhesion, the nephrologist might decide to use desmopressin at the dose of 0.3 μg/kg subcutaneously or intravenously. Dental care providers have to understand that desmo-pressin works for up to 4 h and any dental procedures have to be delivered during that time. It is also recommended to perform dental treatment in one visit, if that is possible, to avoid the need for another dose of desmopressin. Different types of local hemostatic measures can be used in dentistry, such as using local hemostatic agents including oxidized regenerated cellulose (Surgicel®) or Gelfoam with activated thrombin and considering sutures after extraction. Dental care providers can also use tranexamic acid (Cyklokaprone®) in two different ways. It could be prescribed by dental care providers as an oral rinse (15 mL) four times per day for 10 days, or the authors suggest soaking a piece of gauze with tranexamic acid then asking the patient to bite on it for 15–20 min. The tranexamic acid dose needs to be 500 mg/5mL (ampules) for this. Systemic use of tranexamic acid should only be considered after liaison with the patient's nephrologist. Patients with uncontrolled renal diseases have a high possibility of developing dental infection due to defective phagocytosis and impaired function of interleukin (IL-2). Accordingly, some patients might attend a dental clinic with a dental infection. Immediate treatment is required to avoid bacteremia that might infect the arteriovenous fistula. Pus drainage from the tooth or, if necessary, extraction of the infected tooth is suggested. These dental procedures may need to be followed by a course of antibiotics to help prevents an anticipated infection and accelerate the healing process. At this stage, liaison with the nephrology team is necessary to determine the type and dose of antibiotics pre-and post-operatively, if indicated. Impaired drug excretion is one of the most common complications affecting patients with renal dysfunction; however, this could vary from one patient to another based on the eGFR. Nephrotoxic antibiotics and antibiotics that are excreted by the kidney should be avoided, as they might have enhanced or prolonged activity. The patient's nephrologist will adjust the dose of antibiotics based on the patient's eGFR, the degree of renal failure, and patient's dialysis schedule. Saif et al recommended a guideline dose adjustment for the most commonly prescribed antibiotics in renal patients based on the renal function (eGFR). For example, for patients with eGFR of 10–50 mL/min, a normal dose of amoxicillin or co-amoxiclav could be prescribed. Clindamycin, erythromycin or metronidazole could be prescribed at normal dose for patients with eGFR of 10–50 and who are allergic to amoxicillin. However, patients with eGFR <10 mL/min and those on HD or PD require adjustment of antibiotic dose, and they can use 250 mg of amoxicillin three times per day, 375 mg of co-amoxiclav, normal dose of clinda-mycin, 50%–75% of normal dose of erythro-mycin (maximum of 1.5 g/day) and a normal dose of metronidazole every 12 h. Meanwhile, for pain management, it is recommended by nephrologists to avoid the use of non-steroidal anti-inflammatory drugs and to use paracetamol instead, at a normal dose. Management of patients who have had a kidney transplant is similar to the management of patients on dialysis regarding oral bleeding, drug interaction, and dental infection. However, there are some specific differences since they are receiving immunosuppression therapy. A randomized, open-label study showed that tacrolimus is more effective than cyclosporine in preventing acute rejection in cadaveric renal allograft recipients, and significantly reduces the use of anti-lymphocyte antibody preparations. This explains why tacrolimus is the drug of choice to the nephrologists postkidney transplant. It is well known that both cyclos-porine and tacrolimus reduce the immune system to reduce the possibility of the graft rejection; this increases the possibility of dental infection. Therefore, pretransplant dental assessment includes treatment of active disease, delivering oral hygiene instructions, educating patients, and organizing future dental appointments, with the aim to reduce future requirements for treatment is crucial. Cyclosporine affects oral and dental health negatively and leads to gingival hyperplasia., Gingival enlargement complicates oral hygiene, leads to halitosis, and might also affect oral function and chewing ability if it is particularly overgrown. Genetic predilection, and the presence of plaque and calculus with poor oral hygiene, increase the risk of development of cyclosporine-related gingival hyperplasia. There are some cases reported where tacro-limus might induce gingival hyperplasia, while other studies found that tacrolimus has no adverse effects on the gingival tissues and might be considered as an alternative to cyclosporine., The patient's nephrologist should be contacted if there is a gingival enlargement to discuss the possibility of changing the medication prescribed. Moreover, patient education about medication side effects and importance of oral hygiene is crucial. Recurrent oral ulcers occur frequently in this group of people due to the use of immuno-suppressive agents. Treatment of these requires liaison with the patient's nephrologist as this type of oral ulcer responds very well to a medication dose adjustment. Neutropenia might also increase the development of recurrent oral ulcers, and some clinicians refer patients to their nephrologist to receive granulocyte colony-stimulating factors (G-CSF). However, patients with recurrent oral ulcers and taking tacrolimus respond very well to dose adjustment and might not require G-CSF. It is necessary to avoid prescribing any medication without first making contact with the patient's nephrologist. The reduced immunity in patients with kidney transplant taking immunosuppression agents makes oral fungal infection common. Anti-fungal infection treatment should not be prescribed without liaison with the patient's nephrologist, as it might interact with cyclosporine as well as tacrolimus. For example, the azole group inhibits the metabolism of these immunosup-pression agents and increases their levels in the bloodstream. Research shows that patients with organ transplants have a higher risk of having oral and cutaneous squamous cell carcinoma, Kaposi's sarcoma and lymphoma than the general population., As a result, dental team will be required to refer patients with any suspicious oral lesion to a secondary care center for early investigations and treatment. Dental assessment prior starting RRT is highly recommended. This helps to improve patient's oral health, eliminate dental infection, and educate patients about side-effects of medications. Patients on renal dialysis or post-transplant always require a holistic approach by an MDT. They can have a high risk of oral bleeding, dental infection, and possible drug interaction. Accordingly, for safe dental treatment, dental care providers should determine the level of dentistry required (primary or secondary) and always liaise with the patient's nephrologist. NHS. Chronic Kidney Disease in England: The Human and Financial Cost. National Health Services; 2012. Accessed on 4 April 2018. Stevens LA, Coresh J, Greene T, Levey AS. Assessing kidney function – Measured and estimated glomerular filtration rate. N Engl J Med 2006;354:2473-83. Saif I, Adkins A, Kewley V, Woywodt A, Brookes V. Routine and emergency management guidelines for the dental patient with renal disease and kidney transplant. Part 1. Dent Update 2011;38:179-82, 185-6. Hill NR, Fatoba ST, Oke JL, et al. Global prevalence of chronic kidney disease – A systematic review and meta-analysis. PLoS One 2016;11:e0158765. Webster AC, Nagler EV, Morton RL, Masson P. Chronic kidney disease. Lancet 2017;389: 1238-52. Dioguardi M, Caloro GA, Troiano G, et al. Oral manifestations in chronic uremia patients. Ren Fail 2016;38:1-6. Ruospo M, Palmer SC, Craig JC, et al. Prevalence and severity of oral disease in adults with chronic kidney disease: A systematic review of observational studies. Nephrol Dial Transplant 2014;29:364-75. Honarmand M, Farhad-Mollashahi L, Nakhaee A, Sargolzaie F. Oral manifestation and salivary changes in renal patients undergoing hemodialysis. J Clin Exp Dent 2017;9:e207-10. Scully C, Diz Dios P, Kumar N. Special Care in Dentistry. London: Elsevier; 2007. Scully C. Medical Problems in Dentistry. London. Elsevier Health Sciences; 2010. Al-Nowaiser A, Roberts GJ, Trompeter RS, Wilson M, Lucas VS. Oral health in children with chronic renal failure. Pediatr Nephrol 2003;18:39-45. Klassen JT, Krasko BM. The dental health status of dialysis patients. J Can Dent Assoc 2002;68:34-8. Limeres J, Garcez JF, Marinho JS, et al. Early tooth loss in end-stage renal disease patients on haemodialysis. Oral Dis 2016;22:530-5. Xie T, Yang Z, Dai G, et al. Evaluation of the oral health status in Chinese hemodialysis patients. Hemodial Int 2014;18:668-73. Craig RG, Kotanko P, Kamer AR, Levin NW. Periodontal diseases – A Modifiable Source of Systemic Inflammation for the End-Stage Renal Disease Patient on Haemodialysis Therapy? Nephrol Dial Transplant 2007;22: 312-5. Huang RY, Lin YF, Kao SY, Shieh YS, Chen JS. Dental restorative treatment expenditure and resource utilization in patients with chronic kidney disease: A nationwide population-based study. J Dent Sci 2017;12:275-82. Huang RY, Lin YF, Kao SY, Shieh YS, Chen JS. A retrospective case-control analysis of the outpatient expenditures for western medicine and dental treatment modalities in CKD patients in Taiwan. PLoS One 2014;9:e88418. Saif I, Adkins A, Kewley V, Woywodt A, Brookes V. Routine and emergency management guidelines for the dental patient with renal disease and kidney transplant. Part 2. Dent Update 2011;38:245-8, 250-1. Scully C, Dios PD, Kumar N. Special Care in Dentistry: Handbook of Oral Healthcare. London: Elsevier Health Sciences; 2006. Abed H, Ainousa A. Dental management of patients with inherited bleeding disorders: A multidisciplinary approach. Gen Dent 2017;65: 56-60. Nizarali N, Rafique S. Special care dentistry: Part 2. Dental management of patients with drug-related acquired bleeding disorders. Dent Update 2013;40:711-2, 714-6, 718. Nizarali N, Rafique S. Special care dentistry: Part 3. Dental management of patients with medical conditions causing acquired bleeding disorders. Dent Update 2013;40:805-8, 810-2. Kurz P, Köhler H, Meuer S, Hütteroth T, Meyer zum Büschenfelde KH. Impaired cellular immune responses in chronic renal failure: Evidence for a T cell defect. Kidney Int 1986;29:1209-14. Gupta M, Gupta M, Abhishek. 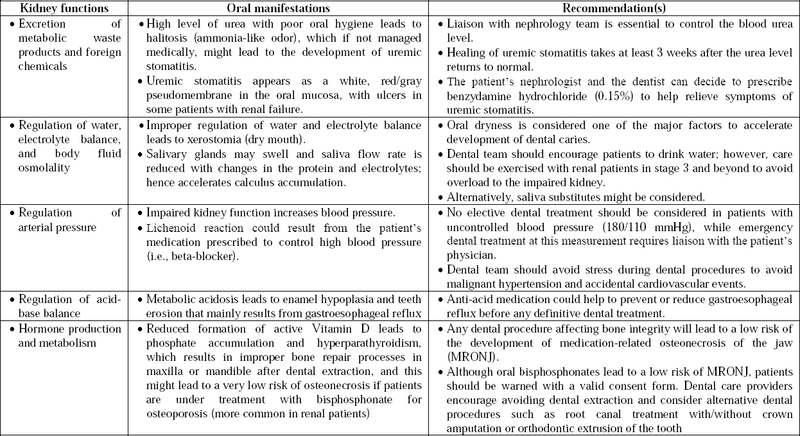 Oral conditions in renal disorders and treatment considerations – A review for pediatric dentist. Saudi Dent J 2015;27:113-9. Pirsch JD, Miller J, Deierhoi MH, Vincenti F, Filo RS. A comparison of tacrolimus (FK506) and cyclosporine for immunosuppression after cadaveric renal transplantation. FK506 kidney transplant study group. Transplantation 1997; 63:977-83. Faulds D, Goa KL, Benfield P. Cyclosporin. A review of its pharmacodynamic and pharmaco-kinetic properties, and therapeutic use in immunoregulatory disorders. Drugs 1993;45: 953-1040. Mayer AD, Dmitrewski J, Squifflet JP, et al. Multicenter randomized trial comparing tacrolimus (FK506) and cyclosporine in the prevention of renal allograft rejection: A report of the European Tacrolimus Multicenter Renal Study Group. Transplantation 1997;64:436-43. Davidovich E, Davidovits M, Eidelman E, Schwarz Z, Bimstein E. Pathophysiology, therapy, and oral implications of renal failure in children and adolescents: An update. Pediatr Dent 2005;27:98-106. Proctor R, Kumar N, Stein A, Moles D, Porter S. Oral and dental aspects of chronic renal failure. J Dent Res 2005;84:199-208. Chatzopoulos GS, Koidou VP, Wolff LF. Systematic review of cyclosporin A-induced gingival overgrowth and genetic predisposition. Quintessence Int 2017;48:711-24. Alzahrani A, Awad N. Tacrolimus-induced gingival enlargement: A case report. J Am Sci 2013;9:271-74. James JA, Jamal S, Hull PS, et al. Tacrolimus is not associated with gingival overgrowth in renal transplant patients. J Clin Periodontol 2001;28:848-52. Thorp M, DeMattos A, Bennett W, Barry J, Norman D. The effect of conversion from cyclosporine to tacrolimus on gingival hyper-plasia, hirsutism and cholesterol. Transplantation 2000;69:1218-20. Sansone-Parsons A, Krishna G, Martinho M, et al. Effect of oral posaconazole on the pharmacokinetics of cyclosporine and tacro-limus. Pharmacotherapy 2007;27:825-34. Stasko T, Brown MD, Carucci JA, et al. Guidelines for the management of squamous cell carcinoma in organ transplant recipients. Dermatol Surg 2004;30:642-50.